In these scenarios, when a customer's order is created, the sales agent associated with the sale of that particular order is matched with the order. This ties the Invoices generated to the sales agent responsible for the sale and facilitates the calculation of commission. The first step would be to Create a Commission Plan. Once the commission plans are set up, we can associate the plan to an order. Select the Plan that the customer has signed up for from the list. Click on the Show Sales Agent link. Select the Sales Agent and the commission plan. 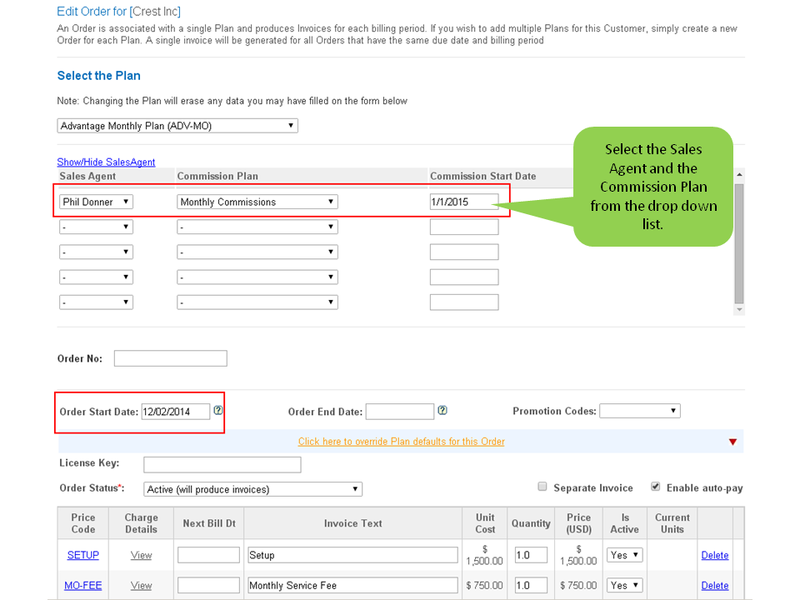 (Once Commission Plans are created as explained above, they are pre-populated in the drop down list). Commission Start Date - If the calculation of the commission is to begin on a date that is different from the Order Start date, enter it here. For Example: In figure 4 below, the order start date is 12/2/2014 but the commission will start accumulating only after the commission start date, which is 1/1/2015, in this case.